We are pleased and honoured again to welcome these two fantastic teachers and dancers at our studio. Bruno and Rocio encapsulate and represent the young tango scene in the most elegant and beautiful way. 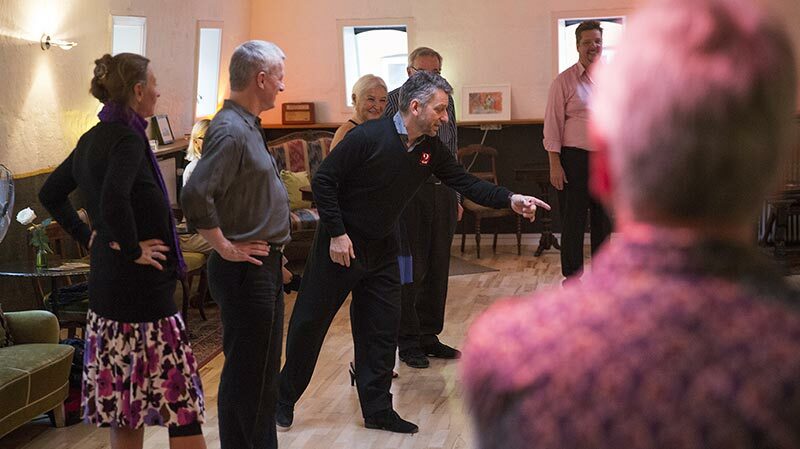 When you take classes with them you will leave their lessons with at least one big new discovery about the tango. Their classes are well thought through and R&B are teaching on top pedagogical level. In their show you can experience pleasure, musical playfulness and intense communication within the couple. Music, flow and improvisation become a unity. The level for all workshops is intermediate to advanced. You can register directly by clicking on the link. The theme for Saturday is "Walking and the pleasure of dancing"
Tango is a couple dance, but we would like to emphasise on the “independent unit”, where each member of the duo will be related to the space, to the music and to his/her body and mind. Tango is for us the “Art of walking in an Embrace” or the walking-dance. Everyone knows how to walk and how to hug and we combine both things to the music. In this lesson we use different kind of “dance challenges”- play with the music, with your partner and with others on the dance floor, in order to make you feel like a fish in the water. Music is everything, it is the main leader, the main connector, the place to play, the journey. Listen to it and recognise the rhythmical options that we have, it is as necessary for this dance as oxygen or the water on this planet. Can we manage the crossed system, as we do with the parallel system, our dance become complete, more fluid and we experience “less mistakes”. We can find possibilities, we have not used before. Using ochos or rebounds in a simple or a complex way help us to complete the ¨walking-dance¨ giving us more skills for the space, the music and it is a good way to explore the crossed system. The theme for Sunday is "Structures and combinations, the other part of the game." Sacadas are a great way to change the dynamics of the dance according to the music. With rebounds you have a simple tool to explore rhythm, space and playfulness. In Tango we have a lot of possibilities to play with the “free” leg. You can entangle yours and your partner’s in various ways- Ganchos, or you can explore the interrupted movement of the leg in a backwards or forwards motion, snappy or slow- Boleos. Barridas are very playful, you sweep your partner's leg over the floor and create a nice surprise. Crosses- how does it feel to cross your legs in all different ways? Have some fun with your partner, who will definitely not be crossed with you. Please notice, you can only register with a partner. We are offering technic classes for both leaders and followers. Working on your own technic makes you a happier and better dancer! We offer a guided practica the same day from 20.15-21.15, where you can get help from an experienced teacher and practice the steps you have learned. TangoCafé is a nice and relaxed afternoon Milonga, where both experienced and new tango dancers are welcome. We bake waffles and children are welcome.